At our first meeting of 2019, held at Connecticut College on January 28, Caroleen Sayej, Professor of Government and International Relations at the college, spoke to us of the important role played by the Ayatollahs in post-Saddam Iraq. She focused on the fatwas issued by Grand Ayatollah Sistani, showing how they supported the development of democratic principles in the new Iraqi political landscape. Indeed, contrary to our often-limited view of the “fatwa” as a religious incitement to avenge a perceived slight on Mohammad (as in the case of Salman Rushdi), she described how it is really a non-binding decree issued to the faithful followers, who are left to implement it as they see fit. Professor Sayej demonstrated our ignorance of the fatwa with a clip from a popular TV program that was both amusing and cringe-inducing for the educated SECWAC audience! She set Ayatollah Sistani’s efforts to promote political recovery in Iraq after the US invasion in the context of the unsuccessful strategy of nation-building implemented by the Office of Reconstruction and Humanitarian Assistance under Jay Garner and the Coalition Provisional Authority under Paul Bremmer. These failed American efforts resulted in part from the absence of proper consultation with senior Iraqi leaders, who to some extent were perceived as still being loyal Saddam Ba’athists; no doubt, an additional factor was a belief in American liberal hegemony: that we know best and will show you the way. Professor Sayej took us up to the re-election of Prime Minister Nouri al-Maliki for a second term in 2010, the disintegration of some security infrastructure resulting from his state-sanctioned sectarian tactics, and the vacuum that was filled by the developing ISIS army. Ayatollah Sistani used his informal political power to prevent Maliki from seeking a third term in 2014; he thus preserved his (Sistani’s) independence from the state and maintained a position of respect for the democratic process. 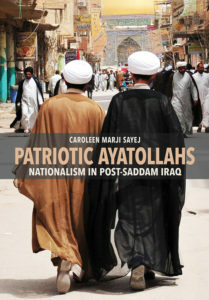 You can read more about Ayatollah Sistani, the fatwas, and the development of Iraq since 2003 in Professor Sayej’s book, “Patriotic Ayatollahs: Nationalism in Post-Saddam Iraq”, copies of which she signed after her presentation. Indeed, as we always do when a speaker does a book-signing, SECWAC bought 2 copies for donation, one to each of the New London and Old Lyme Public Libraries, in recognition of the two towns in which we host the majority of our meetings.